Summer is still going full blast, but here the new school year starts in just a few weeks! It’s time to start gathering supplies, evaluating wardrobes, getting haircuts, and planning any last summer adventures. 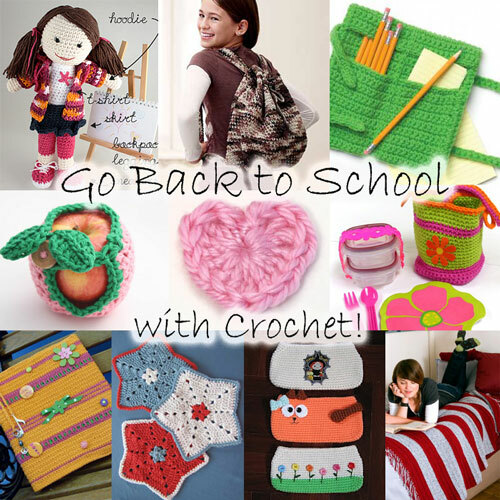 Sad or glad (or a little bit of both), you can send them off to school right – with a little crocheted love from home! The second pencil case goes in a different direction. The Roll-Up Pencil Case holds pencils and more in it’s two pouches. It does have two ties to close it, so best skip it for the youngest students. 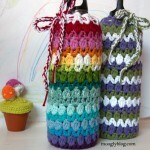 It’s also a great crochet hook holder! We’re finally at an age here where binders have made the list, and this School Spirit Notebook Cover is a great way to show off your personality (without the tell tale Amy <3 Brad doodles that last longer than any crush). If your “little one” is headed off to college this fall, you’ll need to start this one right away! A School Spirit Throw is a fun and practical way to celebrate their new beginning and independence while gifting them with cozy and loving reminder of home. Not guaranteed to ward off homesickness or reckless decision making – but when I find that pattern I’ll be sure to let you know! At the other end of the spectrum, if she’s just heading off to school a Back to School Lily Doll might help her overcome any nervousness. Or just get her good and excited about it. Heck, anytime is a good time for this cutie! 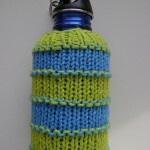 Just like pencil cases, there are tons of crochet backpack patterns out there. The only problem is, they aren’t great for carrying lots of heavy books. But they are good for older kid’s gym bags! Unlike nylon duffel bags they’ll breathe a bit, and hopefully cut down on nasty mildew. And you can throw them right in the laundry with the clothes and keep everything fresh as…well, as fresh as possible anyway. This Camo Backpack pattern works great for guys and girls, is made of washable cotton, closes up tight for privacy, and it’s easy to size it up to fit those giant gym shoes. Don’t forget their favorite time of day – lunch! There are lots of opportunities for handmade here. First you need a bag or box to put it all in. The Happy Bento Lunch Caddy comes with instructions on how to take any reusable containers and turn them into a custom bento set for yourself or your kids. 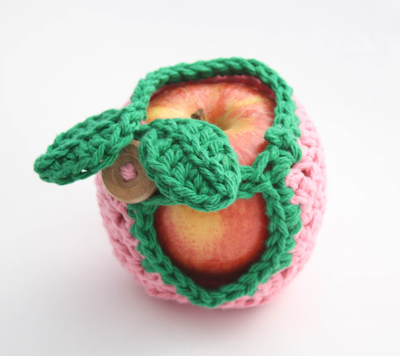 If your kids are as crazy about apples as mine, an Apple Cozy might be just the thing to add that special touch to lunch. This one has great detailing and a really fantastic photo tutorial! The other thing every kid needs at lunch is a good napkin. Eventually they’ll stop using their sleeves, right? The Basketweave Scrubby Cloth is a good option here, or you could whip up a Little Star Wash Cloth for your star student! Bonus tip – wrap it around the more delicate items for a little padding. So… maybe your tiny preschooler doesn’t need all that stuff. 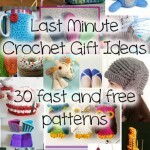 Or maybe your kid doesn’t want crocheted school supplies. No problem. Send them off for their first day with a tiny little something, to let them know they are loved and liked and it’s all gonna be okay. Make them one tiny Love Heart and give them a secret bit of home right in their pocket. I just finished the pencil case and i posted the pattern!! 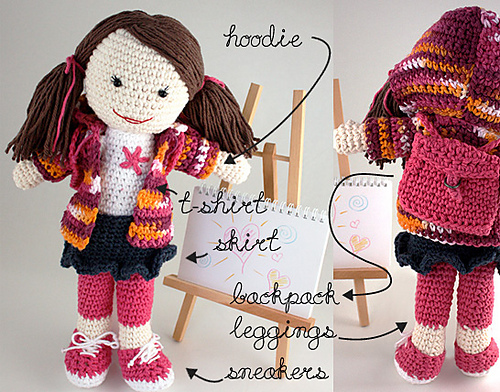 I’ve made the little back to school Lily doll. My 4 y.o. DD is getting it for Christmas. The doll was so fun to make! I made Lily the Christmas elf, too. 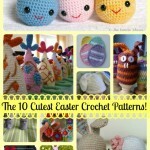 Great pattern and they have tons of others on the site for similar dolls and interchangeable outfits! Thank you so much for sharing these wonderful projects! 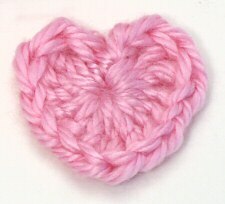 I started the wonderful hobby of crocheting about 3 months ago and love it. Will be starting on the roll up pencil case and notebook cover. This is just too adorable. I don’t have kids of my own. But I have an amazing little buddy at church. I love love love making pretties for her. Thanks so much for posting so many cool things.